Size: A0,A1,A2,A3,A4,B1,B2,B3,B4,letter size,legal size or as your require. We are engaged in offering A5 Paper to our clients. We are well reckoned as one of the overriding A5 photocopy papers Manufacture and supplier, based in India. These photocopier papers are manufactured from the optimum quality paper, using high technology machines. They are available at very moderate prices and that too within the stipulated time frame. The company brings forth the finest quality Photocopy Paper in the market. We offer varied range of A4 Photocopy Paper that comprises of white printing, writing & photo copier paper and so on. We have a wide range of Carbon Paper of best quality available in Rich blue / black color. 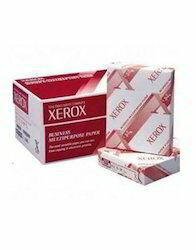 A unioue product of xerox india limited.